[ACT](VC)[1/Turn]:COST [Counter Blast (2)], choose five of your rear-guards, [Stand] them, and they get [Power]+5000 until end of turn. Choose all of your opponent’s units, [Rest] them, and they get [Power]-5000 until the end of your opponent’s next turn. 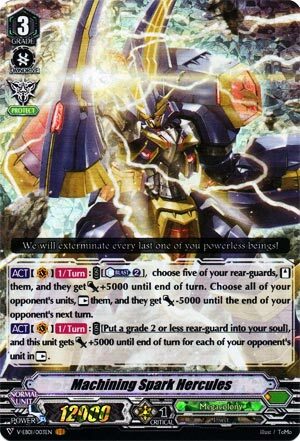 [ACT](VC)[1/Turn]:COST [Put a grade 2 or less rear-guard into your soul], and this unit gets [Power]+5000 until end of turn for each of your opponent’s unit in [Rest]. Well, that’s a pretty drastic change to paralyzing (which apparently Murakumo are going to steal now). So since Vanguard operates on a ‘do-as-much-as-possible’ principle, what you’re looking at is 15k to each of your columns assuming a full field for CB2, even without taking on-call rests into consideration. That’s pretty bonkers, especially compared to how tough Soul Saver is to pull off smoothly without a decent Pongal. Megacolony also have Butterfly Officer and Spiteful Hopper to mitigate even the Counterblast, which helps. The second skill is not so worrisome. It doesn’t have a lot of use Late Game since that’s when the opponent will generally Perfect Guard most Vanguards, and Mid Game, unless you’re packin’ a really good on-hit booster the opponent will just let Spark Hercules hit anyway. So all in all, this is the offensive power you craved for Megacolony all along. Enjoy.